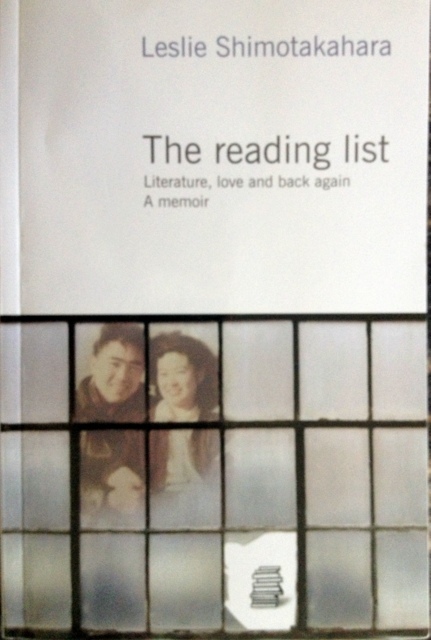 I heard about Leslie Shimotakahara through six-degree connections, bought and read her book The Reading List: Literature, Love and Back Again, A Memoir. In each chapter of her memoir, she relates herself to the character of a book, as she describes her struggle with her career and her relationships with friends and family members. She has included Thoreau, Wharton and Joyce as well as Faulkner, Woolf and Hemingway in her thirteen chapters. Ondaatje and Atwood also make it into her list, among others. I have also found out from her blog under the same title “The Reading List” that she has many insightful reflections weaved into the over sixty book titles she has posted on her blog. When I heard that she would be reading from her work in Hamilton, Ontario, I went out, because I wanted to meet her and ask her to autograph my book. The reading was organized by Litlive and held at the Homegrown Cafe in Hamilton, Ontario. The venue was situated in the re-vitalized downtown area of the city, where artists and writers had moved to in recent years. It offered a casual but cosy setting for this reading event with about thirty people among the audience to listen to the works of six writers of poetry and prose. 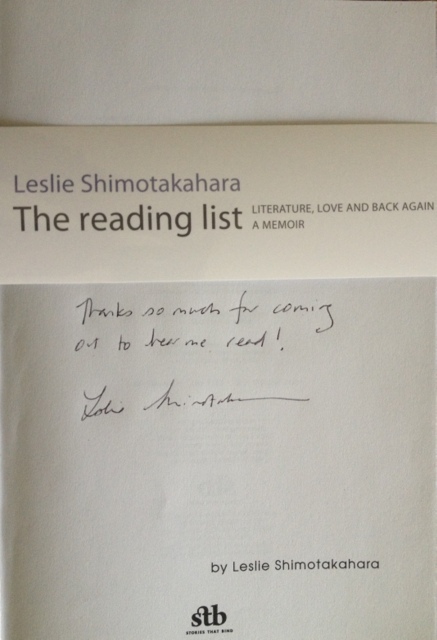 My interest in meeting Leslie Shimotakahara stems not from the fact that I know a member of her extended family who has told me about the book in the first place. It is more because I am fascinated by her talent. Her writing has demonstrated scholarship and style. I admire her courage and frankness in revealing herself and her family in a memoir, though generally memoirs are written by people much older than she is. Her themes are multi-faceted and she has knitted them together seamlessly in her book. I can relate to her feelings about academia, having come from academia myself. It would indeed be difficult if your goals and inclinations are not there to play the role according to the rules of the game, no matter how interested your are in the subject matter and the topic you are conducting research on. Now that I have met Leslie Shimo (guess it is all right to shorten her name like her great grandfather, Kozo, was referred to in her book). I can also identify with her disadvantage of having a young-looking oriental face. It would be tough to be a professor, a bona fida professor she was, in a small east coast town where the parochial outlook predisposed her students to take her at face value (ah, what a pun). I wish I could tell her that I had been asked if I were a teaching assistant by an overseas visitor I met for the first time in a faculty social after I had been a full member on faculty for some years. Part of the revelation in the book was the Shimotakahara family history during the period of internment of the Japanese in Vancouver during the Second World War, and it was spearheaded by her father who tried to extract as much information as he could from her grandmother before she died. Her family saga could be representative of the hardship of many a Japanese families during those difficulty times. I cannot but marvel at Leslie Shimo’s artistry in blending her personal story against the backdrop of the past and present unrest in her family and in the world. The tension was palpable and she handles it with such ease. She read an excerpt from the first chapter of her book. There she was, back home to decide on her next move after leaving the ivory tower and after fulfilling her father’s aspiration for her –although it might not be hers– to obtain a doctorate and to become a professor. I am daughter as well as a mother. When I read that part of the book and listened to Shimo read, I kept wondering: Is this an immigrant psyche, or an oriental psyche? I have to resort to Jung for an explanation of our collective consciousness. Critics and publicity blurbs describe Shimo as “a recovering academic”. As I watched her friendly smile and how composed and graceful she was on stage, Leslie Shimotakahara was already “a recovered academic”, in my opinion. I congratulate her on winning the Canada Council for the Arts Canada-Japanese Literary Award. I wish her well in her new relationship and I look forward to reading her next book. This entry was posted in Books, Culture, Hobbies, Leisure, Life, Reading, Reviews and tagged Canadian Japanese, Leslie Shimotakahara, Memoir, The Reading List on May 30, 2013 by Opalla.